1 of 2 Heat oven to 400 degrees . Slice off top 1/4 of a head of garlic, drizzle with olive oil and wrap in foil, cut-side up. Bake until tender, 45 to 55 minutes. Cool slightly. Unwrap and squeeze out cloves; set aside. Discard skins. 2 of 2 In saucepan, bring 4 cups of water to a boil. Slowly whisk in cornmeal. Stir until it begins to thicken, 1 minute. Reduce heat, cover and simmer 5 minutes. Add roasted garlic and salt. 1 of 1 Meanwhile, heat olive oil on medium-high in a large skillet. Stir in kale; cook about 2 minutes. Add 1/2 cup water, reduce heat to medium-low, cover and cook until tender, 15 minutes. Stir in salt and vinegar. Keep warm. 1 of 1 Toss shrimp with olive oil and red pepper flakes. Spread on a sheet tray; roast at 400 degrees for 8 to 10 minutes, or until pink, turning halfway. 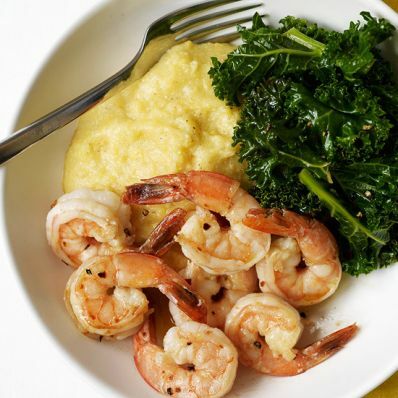 Serve with kale and polenta. Per Serving: 6 g fiber, 815 mg sodium, 2 g sat. fat, 14 g Fat, total, 172 mg chol., 31 g pro., 46 g carb., 425 kcal cal.